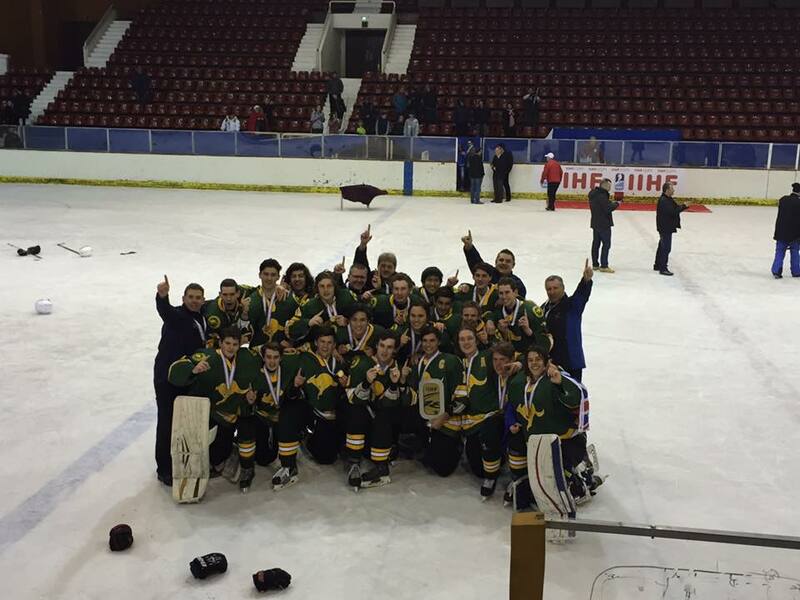 The Australian Youth Team has struck Gold in the Division III world championships just concluded in Sofia, Bulgaria. After defeating Bulgaria 4-3, Chinese Taipei 6-3 and Israel 4-3 the Aussies were well set for what appeared to be the gold medal game clash against Turkey who were also undefeated at that point. The Gold Medal, however, seemed further away after a first period collapse leaving the Youth Team down 4-0. But a character effort saw the team fight back in second outscoring Turkey 4-2. Captain Ellesse Carini and Liam Manwarring each scoring two a piece to keep the gold alive. Turkey halted the Aussies momentum by extending the lead by another two goals. The Captain fought back with another tally to complete his international hat-trick but it wouldn’t enough in the high scoring 9-6 loss. Turkey was in the driver’s seat to win the gold going into final day but there were still plenty of teams in the hunt. Australia needed all dominos to fall into place started with the first game of the day when TPE taking ISR to a Penalty Shot Shootout which gave Australia their first hope to start the day. With ISR winning in the Penalty Shot Shootout 4 – 3 pressured Bulgaria in the next game to beat the undefeated Turkey team to win in regulation time to secure a Bronze Medal. As the second domino fell into place Bulgaria shutout Turkey 1 – 0 gave Australia a second opportunity to regain gold medal. Team Australia then had to secure a regulation win against Mexico to win gold. As Australia opened the game they found themselves down 1 – 0 only 0:24 seconds into the game when Mexico scored from a point shot which was deflected to lead 1 -0. Australia found themselves down 2 – 0 in the second period when a roughing penalty let Mexico go ahead on the power play. Tommy Stevens scored his first goal of game for Australia at 9:30 remaining in the second period when he received an open net goal from a nice three way passing play from Manwarring and Carini. Team Australia then found themselves down another goal only 0:18 seconds into the 3rd period when Mexico went ahead 3 – 1. Team Australia then scored their second goal 0:10 after a power play when Aiden Sillato received a pass from Jordon Brunt and Ellesse Carini to claw back the score to 3 – 2. Australia then tied the game on a lucky goal when Finlay Wood shot trickled through to tie the game. Australia took the lead for the first time of game only seconds after killing off a delay of game penalty call on Australian team captain Carini. Tommy Stevens scored his second goal of the game on a beautiful three way passing play from Carini and Manwarring. Australian Evan Connard then received another penalty with 1:51 left in the game when he played the puck and was called for tripping. Mexico then scored within: 20 seconds to tie the game at 4 – 4 when they pulled their goalkeeper for a 6 on 4 advantages. As Australia needed to win in regulation time, Australia pulled their goalie tied at 4 – 4 with 1:20 remaining in the period. Carini scored the go ahead goal with 1:06 to give Australia the needed lead again. Mexico then pulled their goaltender again to make an exciting last minute of the game. As the siren finally sounded Australia pulled out another rabbit from the hat to secure a 5 – 4 victory and claim the gold medal. Tommy Stevens was named Australia player of the game. Ellesse Carini was named Australian best player of the tournament. Australia Gold, Turkey Silver, Bulgaria Bronze, Israel 4th, TPE 5th, Mexico relegated.